Great for Cut Flowers - Zones 3-10 Fragrant Blooms on Tall Strong Stems Shipped Bare Root - 2-3 eyes Shipping Starts March 1st, 2016 Planting Instructions Included. Tall Cannas do very well over most of the United States, and they love to get plenty of the summer heat. Most varieties are easy to plant and grow. Their blooms come in a wide range of colors including red, yellow, pink, orange, fuchsia, and combinations of all. 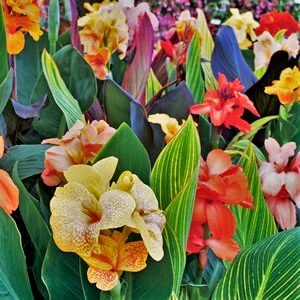 If your wanting that tropical look, then the Cannas with their banana like leaves will be the highlight of the garden. Mature height averages 4-5 foot. PLEASE NOTE; Supplies are limited, and orders will be scheduled & shipped in the order we receive them, so if you want to plant early, then please place your orders early. We have to be fair to ALL of Our Customers - Shipping starts March 1st, 2016. Zones 3-10 -- WEATHER; Your Current Shipping Status could be delayed at any time due to freezing temperatures, this could include shipments to southern locations. The weather all across the States this year has been very unpredictable, if for any reason there is a chance that your products could be effected during transport, the shipment will be held until the conditions are more favorable for shipping.